Like all great love stories, we met on a dating app. But it was 2013 and Tinder was still cool. My first line to Gill was “Hi I’m Matt, 24”, then I went on to confuse her with a story about buying 10 kgs of sugar at Tesco. We met up in Edinburgh, with 2 weeks left on Gill’s visa before she would be kicked out the country. Our third date would be in Thailand. 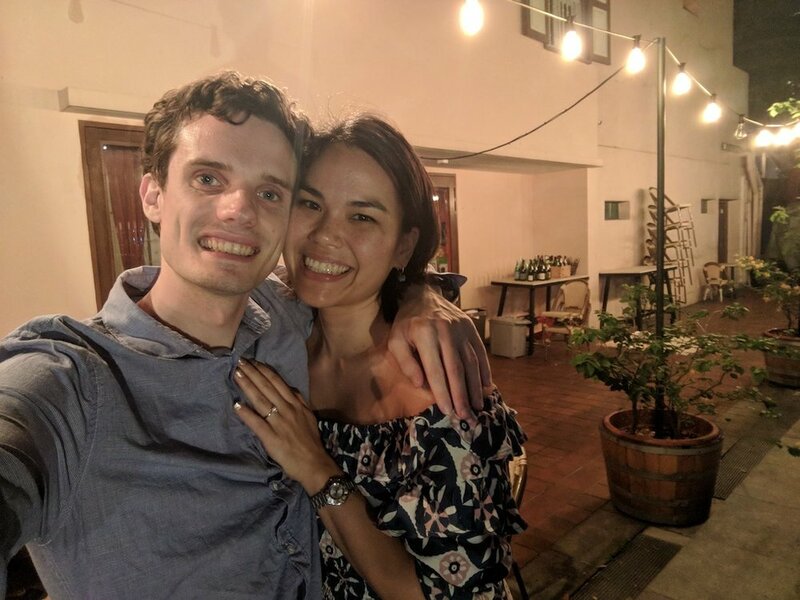 for our third date, I flew to Singapore to meet Gill and we went to Koh Lanta in Thailand. Perfect! We met in Turkey, visiting Istanbul and Cappadocia. Good meeting place. I did my internship with Google in San Francisco area, and Gill came to visit me! I came to stay for a month in Singapore. We got an airbnb and did a couple trips. Gill surprised me with a trip to the Datai in Langkawi on my birthday. I came back for another month in an airbnb in Singapore! Gill came over after christmas 2014 to celebrate new year and to meet New Nicky. The last month-in-an-airbnb trip to Singapore! We planned to move to London together, when I would start my job at Google. Before that we did a big trip in South Africa, visiting Cape Town, driving the garden route, and then going on safari in Kruger. We have stayed in 6 different flats and now a house - Covent Garden & Pimlico in London, two places in Redwood City, San Bruno, and two places in Singapore. Macaroni has stayed with us in five! Gill arriving at our place in covent garden, where google put us up for a couple months. We were finally moving in together after a year of long-distance. Tactical vantage point for the queue to Dishoom. Light-hearted Flintstones melody every night played through a traffic cone, which did not get annoying. Our wee flat in Pimlico. We would both walk in to work, Gill going past Buckingham Palace to Simon Lee gallery in Mayfair. Their was a pigeon gang living in the back. Gill arriving at our first flat in america, another google one in redwood city. our last flat in america, back in redwood city. we recently moved to a small terraced house in chip bee gardens, Singapore. we have a little front and back garden. come visit! We adopted Macaroni soon after moving to America. Her previous family had given her the name, and the shelter was happy to hear we were keeping it. She is friendly and lazy and fluffy. Soon after moving to Singapore, we adopted Mochi. He had been abandoned and found by a train line. It was tricky introducing him to Macaroni - Mochi was a little too playful - but now they are best friends and a great catguy team. We have shared so many happy moments together. We both look forward to making some more with you in September! I spoke to my Dad, and his advice was to prepare some things to say, and to ask her somewhere meaningful to us. I spoke to my Mum, and her advice was how much to spend on the ring. I then gave her a board-game I had made, with lots of landmarks from our 4 and a half years together. There were baddies to fight that represented things we had faced together, and helper cards like “Hyper Macaroni”. I took Gill down near the taxis, to the place where I first said I love you. It’s a special spot for us that we always stop at. I started saying the few sentences I had prepared, and Gill started crying. She said yes very quickly! We got a cocktail to celebrate on the rooftop bar, 71 floors up. I took Gill to her favourite restaurant, Le Bistrot Du Sommelier. Gill started to practise her ring-showing-off poses.